Lake Nakuru is 230 km northwest of Nairobi and the drive to it down the Rift Valley is nothing short of breathtaking. At first glimpse the lake appears to be an inland sea of pink. 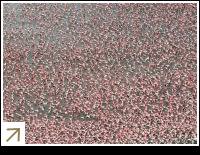 This fabulous pink is all thanks to the lake’s thousand – perhaps millions - of resident flamingos. The birds are here because the lake water is full of food for them in the form of algae. Meaning ‘Dusty Place’ in the local Maasai tongue, Nakuru was founded as a park in 1961 and now encompasses a large area surrounding the lake. The lake itself is a shallow alkaline body of water the size of which can vary enormously from season to season. At its largest the lake covers 45 square kilometres, which shrinks to as little as 5 square kilometres in dry conditions. Lake Nakuru is a birder’s paradise with 400 species located around its shores. Apart from the rather obvious flamingos, other species that are present include avocets, ducks, stilts and little grebes. The park also has fabulous game including the elusive leopard and large numbers of the endangered black rhino, as well as all the regular plains game. The lake is located in the centre of the park and takes about an hour to drive around. Lake Nakuru is extremely popular with all visitors to Kenya because of its diversity and proximity to Nairobi and the other Rift Valley lakes. Below are our tours which take in Nakuru National Park but if you don’t see what you are looking for or would like to visit on a private tour get in touch with us and we’ll show you how we can help.